There is nothing more wonderful than getting lost in a story..using your imagination. Love this...love those kids of yours! 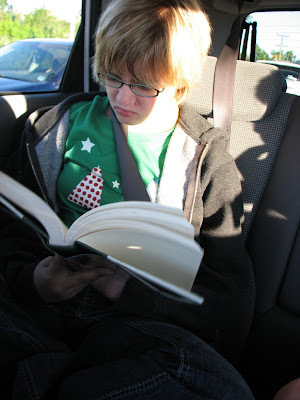 my son loves books, but is struggling to read on grade level in third grade. he reads s.l.o.w.l.y.--too slow for his quick mind and avid imagination. so it's hard for him to stick with it. that was long...I'm wordy this morning...yikes! Oops. Apparently I don't know my left from my right. That jewel would be on the RIGHT side of my computer. What a blessing to have readers in your midst. A love of reading is one of my most important goals as a mom. So far the little one loves books and I really hope it continues. I'm with them. There's nothing I'd rather do than read. I think that's one of the reasons I like our blogging community so much--we get to READ one another's words! I love your back seat photos. Those are cool. They grow up too fast, don't they? Cheers to those who love to read and just can't stop themselves! 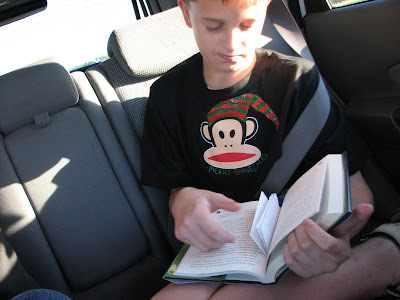 I love to read and it delighted me too when me kids embraced reading. Read on! Reading opens so many doors for our imaginations. It's awesome that they BOTH love to read! I saw something recently (movie? sitcom? I don't remember) where someone suggests a teenage boy go to a public library and the boy is absolutely astonished to learn that the libary will let him take all.the.books.he.wants.for.FREE. It was meant to be funny, but I think it was also a rather pointed commentary about our society's lack of appreciation for books. I am smiling because I've got book lovers too!